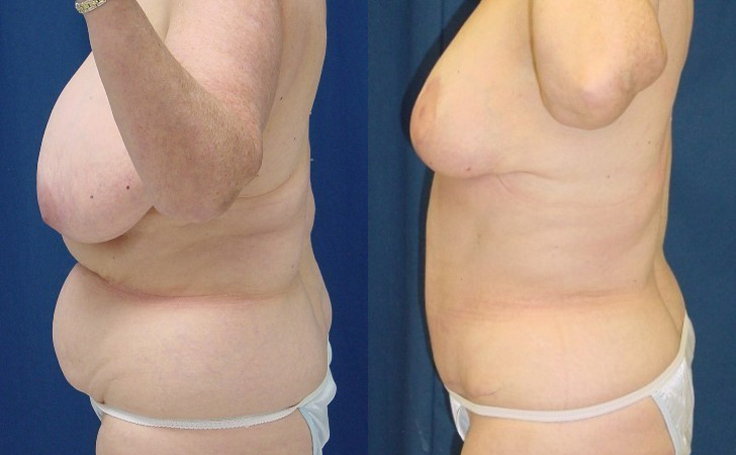 This 60-year-old patient decided to have Breast Reduction along with tummy tuck and liposuction by Dr. Ricardo Rodriguez in his surgical faciltiy in Baltimore. Breast Reduction, a procedure that lifts the breast and makes it smaller, is considered a reconstructive surgery and is often covered by insurance since it is commonly used to relieve symptoms of back pain, neck pain, and breast pain. Many patients, like the one shown here, also elect to have Liposuction or Tummy Tuck performed at the same time so that the lower body will complement their new, smaller breast size.